Vivia Lewis joined Astyra as a Recruiting Assistant earlier this year. 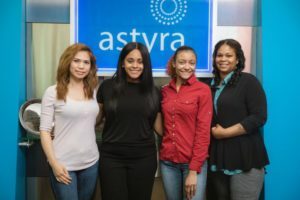 Ms. Lewis’ role at Astyra is to source and screen for qualified candidates, edit resumes, schedule interviews and communicate with contractors regarding their assignment. Taylor Choyce was born a California native; she made her way to the east coast in 2013 to obtain a Bachelor’s Degree of Science in Business Management. Taylor has recently joined our team at Astyra as a Recruiting Assistant. Tianna Mosby is Astyra’s Operations Admin & Executive Assistant. She is the first face you will see when you walk into our office and acts as the operator when you call. Tianna has her Bachelors of Science degree in Mass Communications.